Arizona fourth grader Kyera McCloskey got an accidental lesson in infidelity earlier this week. According to ABC15, McCloskey and her fellow students at the Playa Del Rey Elementary School in Gilbert, Ariz. were given a very grown-up homework assignment on Monday. The students were prompted to read about various situations, describe what was happening in them and then offer a response or solution. One such “situation” was about a woman finding a hair clip underneath her bed with another woman’s hair in it. McCloskey suspected the question had to do with cheating, but consulted her mother for clarification. “I kinda had my mom help me with the answer a little bit because I didn’t want to go too deep into what it was trying to ask me,” she said. After McCloskey’s mother called the school, the teacher quickly apologized, admitting she had not read the assignment carefully. “That’s not a subject matter the school needs to bring up to my child,” McCloskey’s mother said. 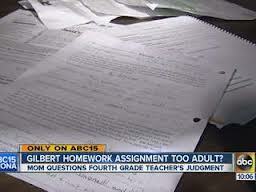 But this isn’t the first time elementary school students have received an inappropriate homework assignment. In February 2012, parents of a Queens kindergartner were up in arms over a spelling worksheet that included violent images, such as a gun and an armed robber. This entry was posted on February 18, 2013 at 11:02 pm and is filed under Homework. You can follow any responses to this entry through the RSS 2.0 feed. You can leave a response, or trackback from your own site.